The village of Pilsbury in Derbyshire is what experts call a “shrunken Medieval village,” to the rest of us it’s a hamlet. Pilsbury is the start of a new fascination (sorry). Obviously Derbyshire has Peveril Castle in Hathersage and there’s Haddon Hall which may indeed rejoice in the name ‘manor’ but which looks decidedly castle-ish but where are the rest of Derbyshire’s castles? They seem to have gone missing. Apparently there’s a site for a castle in Bakewell but its hardly on the tourist trail. Some ten miles from Bakewell, to the north of Pilsbury along the Dove Valley lies the village of Crowdecote which may have a motte, or large man-made mound upon which to stand a castle. Unlike so many other counties in England the castles of Derbyshire appear to be transient commodities. Not even the Earl of Shrewsbury’s castle at Sheffield survived the test of time. So, I’ve added castle spotting to my list of peculiarities. Pilsbury Castle, which does at least rejoice in the name ‘castle,’ lies between Crowdecote and Pilsbury. It is inaccessible by road. You can’t hear any traffic, just the gurgle of the River Dove as it winds around the spur of land on which the earthworks that were once a de Ferrers motte and bailey castle stand. The name Pilsbury gives a clue as to how old the defensive site may be – “pil“ comes from the Celtic, ‘bury,” from the Saxon and “castle” from the Norman – and they all mean much the same thing. Whatever the name of Pilsbury may tell us the archaeology is determinedly Norman with its one wall built into a natural outcrop of rock that was once a reef and its many green banks and mounds that depict a motte and bailey castle – actually its a two bailey castle as the helpful guidance board provided by the Peak District authorities illustrates. There are several theories as to how Pilsbury came to be built in the upper Dove Valley. The first is that it came into being during the so-called ‘harrying of the North’ between 1069-1070. The idea is that the Normans having destroyed people’s homes and livelihoods found themselves in a situation where those Saxons who survived took to the hills and turned to outlawry in order to survive. If this was the case it then follows that the Norman landowners had to build defences to keep the Saxons firmly under control especially somewhere like Pilsbury which stands near a ford and a packhorse route and is in terrain ideal for fugitives. It’s not too hard to imagine the dangers of an attack in this isolated spot. There is a problem with this though, as elsewhere in the country. Hartington and the Dove Valley were in the hands of the de Ferrers’ family. It is unlikely that William the Conqueror would rampage with fire, sword and salt across lands belonging to powerful favourites as the yield from those lands would fall rather drastically as a result making their acquisition somewhat pointless. The same may be said of landholdings, notably in Yorkshire, belonging to Alan the Red for example. So if that theory doesn’t appeal, how about the Normans turfing hardworking Saxons off their lands in order to create a wilderness where they could hunt. The disposed Saxons may well have taken to the hills and caves in the Dove Valley, again turning to outlawry just to survive. Alternatively maybe the de Ferrers simply wanted to stamp their authority on their land with one of those new fangled castles just to remind the locals who was in charge or to extract “tax” as pack-horses laden with salt and other goods crossed the ford. A further theory derives from the years of the so-called “Anarchy” when King Stephen and Empress Matilda were slogging it out to see who would rule England. The Rive Dove marks the boundary between lands belonging to the Earl of Derby and lands belonging to the Earl of Chester. Let’s just say that between 1135 and 1153 the pair were not the best of friends with the Earl of Derby backing Stephen and the Earl of Chester backing Matilda. Under those circumstances with a ford just down the valley a fortification becomes rather a sensible idea. Actually come to think of it, the two earls weren’t terribly friendly at other times in history so the castle may simply have been built as part of a neighbourly dispute. The written record after its construction is somewhat vague too. Pilsbury is mentioned in the Doomsday Book but not the castle. 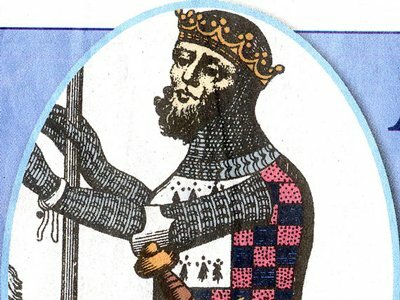 Pilsbury is mentioned again in 1262, again the land not the castle, when the Earl of Derby, Robert de Ferrers, granted land to Henry of Shelford. Four years later the Earl of Derby was up to his neck in rebellion and his land was promptly confiscated. By the thirteenth century the land on both sides of the river was in the hands of the Duchy of Lancaster so there was no need for a defensive structure. And that as they say, is that – though I think we can safely say that the History Jar will be sporadically peppered with images of grassy knolls and hummocks purporting to be Norman mottes. So far as Pilsbury Castle is concerned, it is possible that the castle was used as a hunting lodge during later times but it ceased to be a centre of administration after Hartington received its market charter in 1203 from King John. Harold Godwinson became King of England on 6th January 1066. He was married to Edith, the daughter of Earl Alfgar of Mercia. Edith didn’t have much luck with husbands. Her first one was a welsh king who died in 1063. Three years later she married Harold in March 1066. Nine months after that a bouncing baby boy was born in Chester – Harold of Chester. Other sources say he was born early the following year. In either event Edith and Harold sought shelter in Ireland before heading to Europe in the aftermath of the Battle of Hastings. Nothing further is known of them although there is some suggestion that they may have been given sanctuary in Norway. It is also possible that Edith went to the nunnery at St Omer where his mother and one of his daughters fled after an abortive uprising against the Conqueror. History once again provides tantalising hints but not the full story. Edith was possibly the mother of Ulf, another of Harold’s sons – although it is equally likely that rather than twins Uf was the son of Harold’s lover Edith Swan-neck. It has been suggested that the unknown woman on the Bayeux Tapestry fleeing with a child from a burning building could be Edith swan-neck and Ulf. The pair could just as likely be representative of the innocent citizens of Hastings who found their buildings burning around their ears. Somehow or other Ulf found himself safely secured in Normandy. History doesn’t say what happened to him although he was alive according to Weir (Britain’s Royal Families) in 1087. Harold’s lover, Edith Swan-neck was the woman who searched the battle field for his body in the aftermath of Hastings. It was she who’d provided Harold with at least five children who were, in 1066, a threat to William’s quiet enjoyment of his new kingdom. King Harold’s mother, Gytha held out against the Norman invaders in Exeter. She chose 1067 when William returned to Normandy to make her presence felt. Exeter fell after eighteen days but their determination gave Harold’s mother, his sister Gunnhild and his daughter Gytha time to escape to the Island of Flatholme in the Bristol Channel before following in the sails of other English refugees to the continent and the nunnery at St Omer which was in the domain of Count Baldwin VI of Flanders. Harold’s mother and sister remained there for the rest of their lives. Harold’s daughter Gytha on the other hand married, through Swedish diplomacy, the Russian Prince of Smolensk, Vladimir II. He went on to become the Grand Prince of Kiev and she mothered somewhere in the region of eight sons and three daughters. Her descendants became kings of other nations and one of her descendants was a Queen of England – Edward III’s wife, Queen Philippa of Hainault- which means somewhat bizarrely that the blood of the last Anglo-Saxon King of England flowed in the veins of the Plantagenets and indeed of every monarch since: an unexpected twist to the tale that we don’t learn at school. Harold’s sons Godwin, Edmund and Magnus went to Dublin after the Conquest. 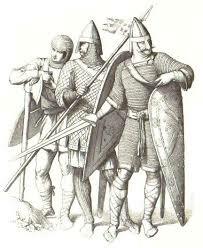 They returned in 1068 with their swords in their hands and a force of Norse mercenaries from the Kingdom of Dublin. They weren’t warmly received in Bristol so made for Taunton – by sea- where they were seen off by a Saxon who’d submitted to William and who no doubt knew which side his bread was buttered. The unfortunate Saxon,Eadnoth, died during the ensuing battle but so possibly did Harold’s son Magnus. Then again may be Magnus didn’t die. There is a curved inscription in the church of St John in Lewis, Sussex that details the presence of a Prince Magnus of Danish royal stock who became an anchorite there. Could the Danish reference be a red herring to hide Magnus? Of Godwin and Edmund more is known. Although defeated in 1068 they were back the following year with sixty ships. They attempted to take Exeter but were seen off by the Norman garrison in their shiny new motte and bailey castle so they settled on causing trouble in the South West but were seen off once more. They are last heard of in the court of King Swein of Denmark. Another of King Harold’s daughter, Gunnhild, was a nun at Wilton or at least a woman seeking shelter from the Normans in the nunnery where she’d received her education. Alan the Red, Earl of Richmond, made off with Gunnhild in August 1093 and that is the subject of a previous blog as well as a topic of Norman Scandal since she refused point blank to take herself back to Wilton when the Archbishop of Canterbury suggested that she should do so.